Caviar nails swam onto the scene at the Cushnie et Ochs Fall 2011 show, where models walked the runway with a black-on-black polish and seed bead manicure. From there, the trend took off and Ciate now has a caviar manicure polish that is available for purchase on their website or through Sephora. 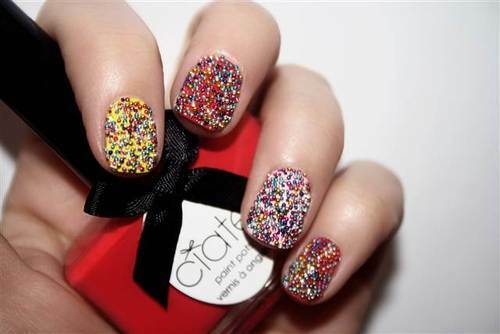 Ciate has three nail kits available: Rainbow, Black Pearls and Mother of Pearl. These polishes sell for £18, or about $28. I have the Martha Stewart Microbead Set. The set offers 12 different colors of beads for only $16. While the DIY version of this manicure can be very time consuming, you end up saving quite a bit of money. There are four steps to this process. 1. Paint your nails with one coat of polish. Let it dry. 2. Paint a second coat. 3. Pour the desired beads onto wet polish (this is the messy part). I used small bowls to catch the extra beads. This trend is great because it’s very versatile. While black polish may be on its way out, you can make a caviar manicure out of any color, including the lovely pastel shades that have been popping up everywhere. Here are a few examples of how to caviar. Essie’s “E-Nuf is E-Nuf” with red beads. Essie’s “Sugar Daddy” and “Milky Way” with a beaded caviar ombre. Another fun trend to try right now is a reverse French manicure, where you paint the moons of your nails instead of the tip -- why not add some caviar? Note: The clear beads don’t show up against the polish. I tried making a heart on my pinky nail, but the design didn’t show up. I’m a big fan of the “odd one out” manicures plaguing (in a good way) Pinterest and Tumblr right now. Check out this blog for some inspiration: katrinasnailblog.blogspot.com. You can make caviar nails summery and light! I wore them to the beach, work and dance class, and they still haven’t worn off. The key is a double layer of topcoat. Don’t try to do anything (brush your hair behind your ear, etc.) before you apply the topcoat. This look is really cool!